The End of the Old Order by Eric Evinczik. Imagine history museum diorama displays of long-gone species. 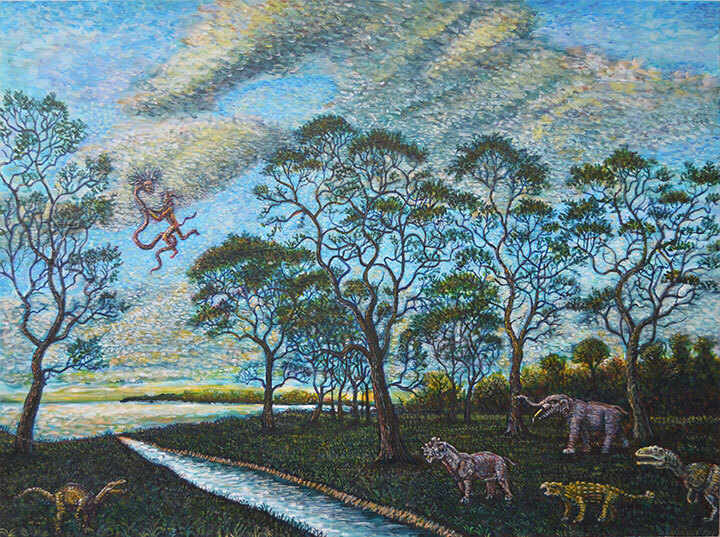 Picture grand pastoral landscapes teaming with prehistoric creatures, snakes, angels, and demons. Think Jurrasic Park meets Garden of Eden. The thirty-one paintings by Eric Evinczik present a vision of primitive behavior as we take an evolutionary trip back through time. At first glance, we see colorfully lush and fanciful representational works featuring roaming dinosaurs. Look more closely to notice the detail of these dense environments as supernatural beings and animals from earlier eras are juxtaposed in pre-modern landscapes reminiscent of specific artists and movements from 17th Century Dutch to 19th Century Hudson River School. The folktales and mythical stories pertaining to these beasts are gone now, but the artist provides a brief back story for each painting. An art educator with the Buffalo Public Schools, each of his paintings describe a specific encounter with Ceratosaur, Parasaurolophus, Triceratops, etc. While there is an otherworldly dreamlike quality to these scenes, they are grounded in science and mythology with equally weighty titles, such as: The End of the Old Order; Swamp Apocalypse; Cicle of Life. Duo (Flight of the Fairies) by Eric Evinczik. Evinczik also hosts the Facebook page ”Mind Wide Open: A Contemporary Art Criticism Group,” a platform for lively discussion about all aspects of visual art today. The content of his painting can be linked to the notion of peaceful coexistence between all beings and nature found in the work of Thomas Cole and the Luminism movement of his student, Frederic Edwin Church. Yet, there is also kinship with the darker bio-apocalyptic futuristic visions of contemporary artist, Alexis Rockman. The scientist Carl Sagan said that “extinction is the rule—survival is the exception.” The canvases are evidence of human survival and offer a playful stage where extinct animals gain immortality as they come alive in the 21st century. The exhibition at Artspace Buffalo Gallery will remain on view through June.